Did you know the USPS offers a military discount for the holidays? Any package sent to a APO/FPO/DPO address (worldwide) will receive a $2 discount (totaling $15.45) on their largest priority mail flax rate box. Additionally, USPS is donating FREE Military Care Kits including 4 flat rate boxes, tape, address labels, and custom forms. To request a free kit, call 800-610-8734. REMEMBER! 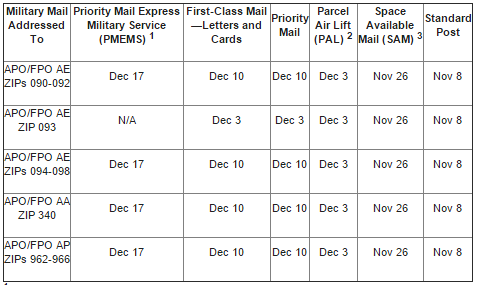 To ensure that mail arrives to Military Bases by Christmas day, the deadline is to get it shipped is NOVEMBER 8th (or see a more detailed list HERE).